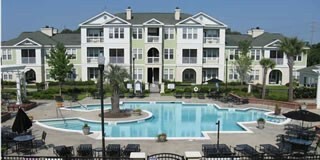 Southampton Pointe is situated right in the heart of Mount Pleasant, South Carolina and is a beautiful gated community that offers many superior amenities to its residents. In the fall of 2013, renovations began on the existing buildings to replace the facades and install new windows and air barrier moisture control. The renovations encompassed 15 buildings including 220 units. The Polyguard Airlok Flex WG system was utilized to add a new water resistant barrier and to reinforce and waterproof the window openings, which included over 300,000 square feet of installed product.